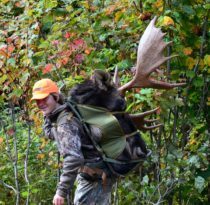 Dave Conley, full time guide and outfitter, offers guided moose hunts in Maine’s Wildlife Management Districts (WMD) 1,2, 4 & 5. 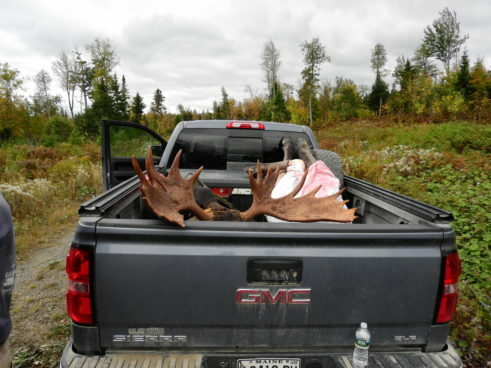 These WMDs have the largest population of moose in Maine. 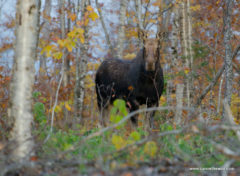 The September and October moose hunting seasons coincide with the rut, September being peak rut. 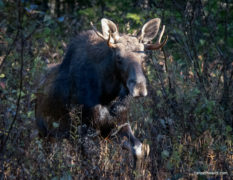 Much like turkey and elk, moose can be very susceptible to calling. 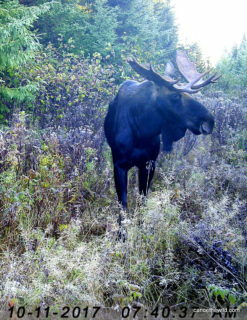 What a thrill to interact with a trophy bull moose as it responds to the call. 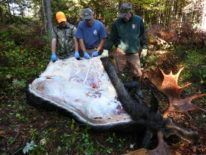 Maine has one of the highest, if not the highest success rate for a big game hunt anywhere! 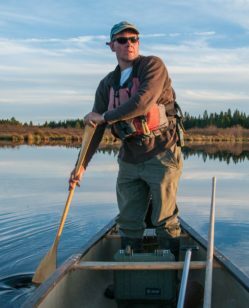 Nonresidents typically enjoy an even higher success rate over residents attributed to the fact most hire the services of a Maine guide. 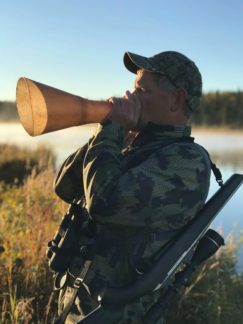 Dave has personally guided over 30 moose hunts with a 97% success rate. 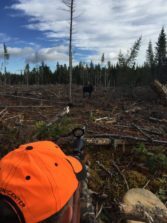 In fact, the only time we did not harvest a bull was on a last minute one day hire. 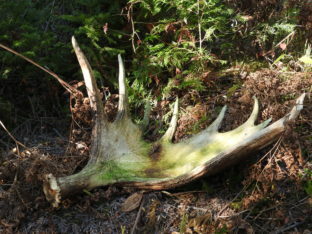 Prime Rut Hunt Available for Immediate Purchase! 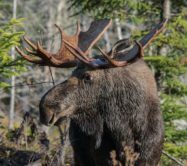 A new law recently passed by the Maine legislature allocates 50 moose permits to Maine sporting camps through a special lottery. 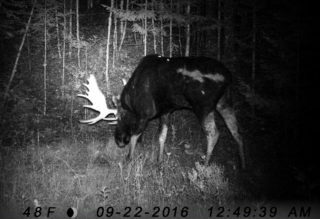 We are working for a sporting camp that has a bull permit in Wildlife Management District 1 during the September season which is peak rut. 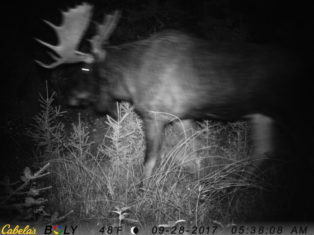 In 2018, WMD 1 had the highest success rate of all the WMDs at 87% success rate on bulls! 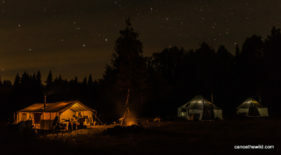 See report here. 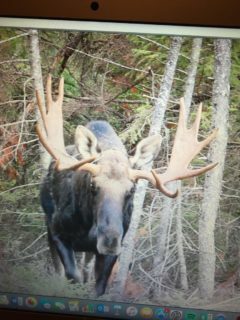 This is NOT A ROAD HUNT and we do not use electronic calls. 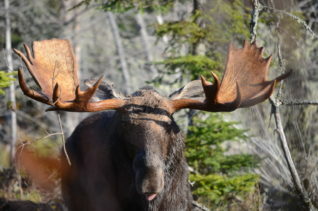 Our guides know how to read sign, locate and call moose. 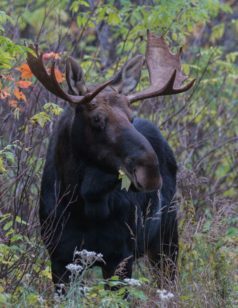 With the ability to quarter and pack out moose, we’re able to get on foot to spot n stalk, placing you in Maine’s best moose country. 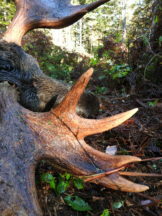 Expect opportunities to harvest a bull with rack widths middle 40″s to middle 50″s, bulls with wider racks are possible. 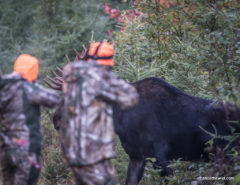 We encourage hunters to pass on smaller bulls waiting for an opportunity on a bigger bull. 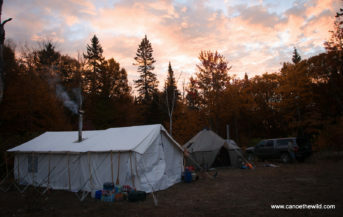 Why not visit Trip Advisor and read what past canoe guests and moose hunters have to say about their experience with Dave Conley and Canoe the Wild. 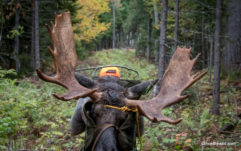 While many hunters drive more then an hour one way each day just to get to their hunting grounds, our camps are located in the heart of prime moose hunting country well away from any towns. 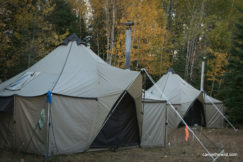 Camps include top-notch accommodations, the main shelter serves as a community area for meals. 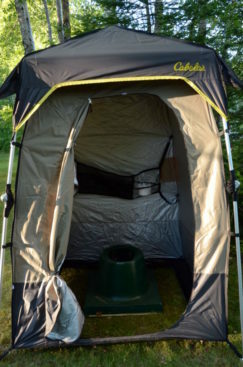 Private sleep tents for your party of 1-3 persons are spacious 12′ x 12′ Cabela’s Alaknak Ultimate Outfitter tents complete with cots, carpet flooring and a wood stove. 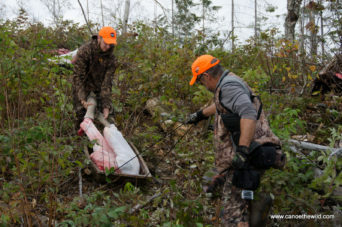 it’s 24 degrees in WMD 1 and bulls are not coming to the cow call so we change tactics on a distant grunting bull. 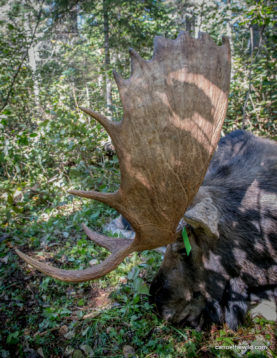 After a quarter mile spot n stalk and challenging this 11.5 year old bull, he came in like a freight train! 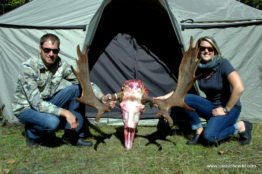 What a thrill as Adam harvested this bull at under 25 Yards (more). 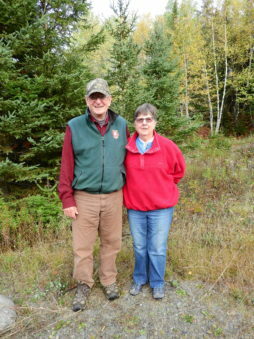 For those with physical limitations, we hunt close to dirt roads or shorten the distance we travel on foot. 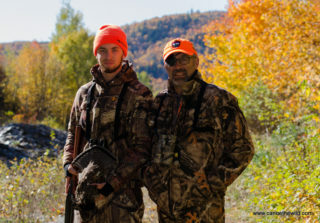 We’ll adapt your hunt based on your physical abilities and desires. 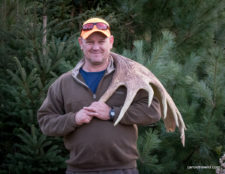 Caping of your moose for a European or shoulder mount. 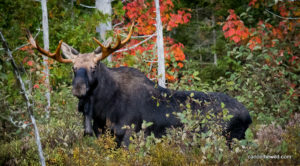 Note: We are fully insured and licensed with the North Maine Woods to conduct guiding activities in the North Maine Woods. 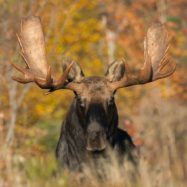 Hunting License & Moose permit, non-resident big game license $115.00, moose permit $585.00, Maine residence license $26.00, moose permit $52.00. 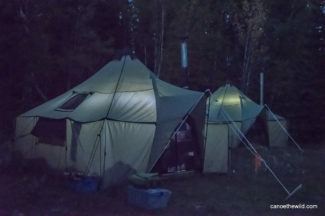 Extra persons (apart from you and your sub-permittee) is $700.00 per person for meals & accommodations. 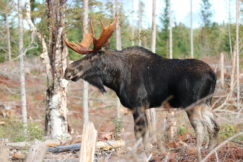 Private Land Access Fees collected at the gate as you enter the North Maine Woods. 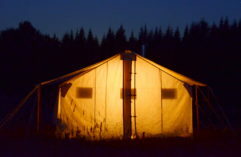 Nonresidents $30.00 per day, $22.00 per day for Maine residents. 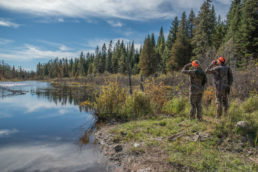 Ages 17 and under are free. 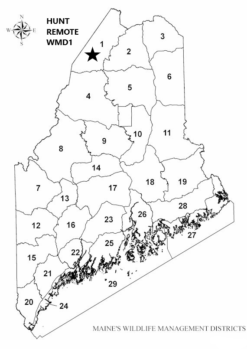 Nonresidents ages 70 and older $15.00 per day, Maine residents ages 70 and older $12.00 per day. 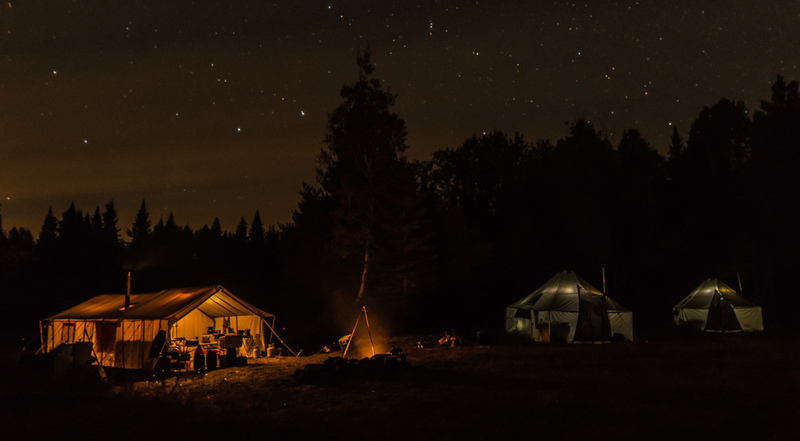 Transportation, you can drive right to camp. 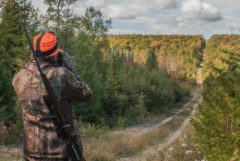 For those that are flying into Presque isle, we recommend staying overnight at the Hampton Inn before and after your hunt. 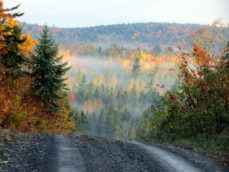 The ride to camp is $200.00 each way (three hours each way over tar and mostly good dirt roads). 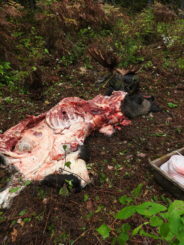 Having you moose butchered locally? 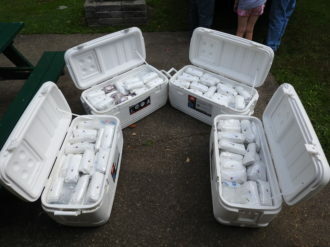 We have a local guy that does a great job cutting and packaging meat. 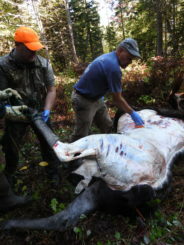 Turnaround time is 48-72 hours. 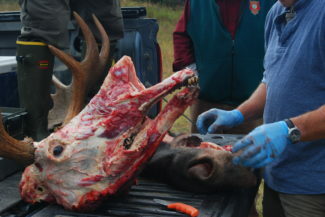 He charges $500 to cut up a moose. 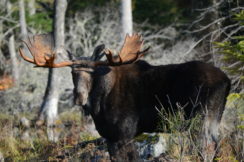 To secure your lottery Moose hunt, once you have secured your permit through the lottery or auction, a deposit of $1000.00 is required with the balance due 30 days prior to the hunt. 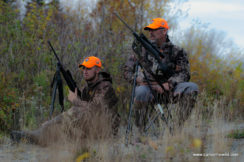 When you are ready to book your hunt, call 207-551-8729 or 207-448-2743 or email us from our register/contacts webpage. 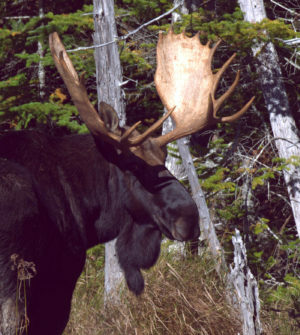 Having your moose mounted? 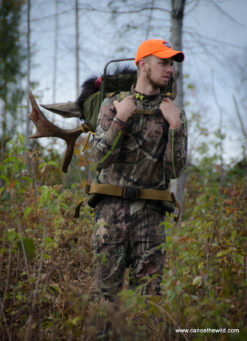 We can recommend options where you can drop off your rack and cape. 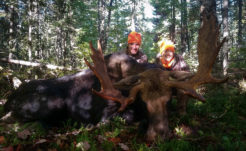 The state of Maine auctions off 10 permits in February to the highest bidder with the proceeds benefiting Maine kids going to conservation camp. 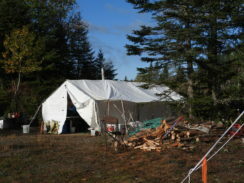 The winning bids for 2019 went from $18000.00 to $22,000.00 and that is just for the permit! 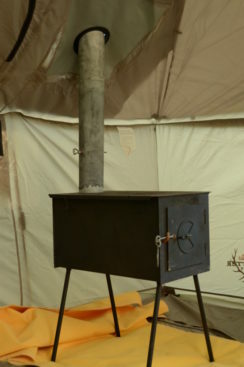 The deadline for applying on line was February 14th. 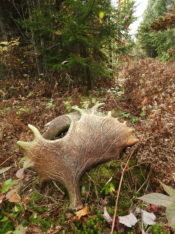 Photos of Moose hunts Dave has personally guided through his own outfitting business and some while guiding for Smoldering Lake Outfitters.